Easy-to-use 3-button interface, convenient and easy-to-carry everywhere. 100% organic silicone touch points make face washing more safe and clean. Remove makeup impurities, all-round clean brings a fresh and radiant skin. Bring firmer skin and facial rejuvenation, Help to improve the absorption of skincare products. A silicone facial brush can fit for all type skin that channels both T-sonic pulsations for deep yet gentle cleansing, and lower-frequency pulsations to reduce the signs of aging. You'll see the effect takes just 2 minutes each morning and night in a few days. After the cleansing, you can use the low-frequency pulsations focus on wrinkle-prone areas. This can help diminish the appearance of fine lines and wrinkles, gently dislodges skin-dulling dry cells to make skin glossy and white. I'm absolutely in love with this EasyFace Sonic Face Cleaning Brush! I've been using this for a few weeks now and I'm blown away by how soft and radiant it's made my skin. I use it once in the morning and once at night and love the results I've gotten. It's very relaxing to use and extremely gentle on your skin. I love using it at night because it removes every trace of makeup in just a couple of minutes. Another great result I've gotten with EasyFace Sonic Face Cleaning Brush is that it has removed all my dry flaky skin. I have extremely dry skin so I love that the flaky skin is a thing of the past and now my makeup goes on evenly and there's not a single dry patch on my face. I love that the EasyFace Sonic Face Cleaning Brush has three speeds and an automatic timer. Another great thing about this brush is that it requires no replacement brushes and because its nonporous, it stays clean. It's also waterproof so you can use it in the shower if you'd prefer. EasyFace's Sonic Face Cleaning Brush cleanses skin completely thanks to it's sonic pulses and adjustable pulsation intensity. EasyFace's Sonic Face Cleaning Brush has greatly improved my complexion and I highly recommend it! 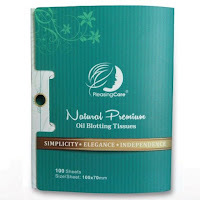 Check out my Pleasingcare Oil Absorbing Tissues Review! Interesting little cleaning brush! I looks super cute and I love the colors! I would LOVE something like this! It looks amazing! I should look into this--I always feel like when I clean my face that I'm not getting deep into my pores. This sonic cleaning brush probably would work wonders on my face! How cool! I recently got a cheap facial brush and I was eyeing this one! I love anything that comes in bright colors. This looks easy to use and very convenient. What a FUN little brush, looks like an easy way to amp up your beauty routine! I have never seen one of these. I bet it is really good for skin. This seems like a great product to try. I have tried a face cleanser before, but the bristles on the brush were a little rough. I bet the silicone felt nice! This looks like a great product. It would be great to try out.